Melbourne-based transport entrepreneur, Manny Camilleri decided to consider a PBS truck and dog tipper combination for his business on the advice of long-term partner, Hamelex White. Serving the construction material giant Boral since 1984, Manny Camilleri understands the importance of keeping up-to-date with industry trends in the quest for business success and expansion. Moving into the Performance Based Standards (PBS) field when purchasing their latest truck and dog combination would help the transporter increase payload, bring the company’s performance to the next level, and also serve his client better. According to Manny, the association with Boral and Hamelex White is all about trust, which has been built since he joined the transport industry at age 18. He always deals with Hamelex White whenever he needs a new tipper for the Boral contract. Pointing out the latest PBS-approved three-axle rigid and dog combination, he said that the advantage of PBS is that it factors the trailer’s actual performance on the road instead of focusing on size and length alone. Since the whole vehicle is pre-approved, the registration process is simple and fast with no waiting around for applications to be tested and approved by various authorities. Once the combination was built, Manny was able to drive it straight out the gate. Manny’s new tipper can now carry as much as 49.5 tonnes and still maintain its stability on the road because of its low centre of gravity. Once Hamelex White guided Manny through the benefits of PBS, applying the finishing touches to the rest of the production was a foregone conclusion. To achieve the maximum in strength and flexibility, Hamelex White designed a high tensile steel chassis, while fitting drum brakes and ABS. The tipper bin is based on a 6mm high tensile aluminium floor plate welded directly to the main bearers, along with 5mm aluminium side walls. The entire set-up was also dictated and tested by computer simulation prior to build. The three-axle tipper combination is the third to join the Camilleri fleet, which also includes one rigid and a single semi-trailer, all servicing Boral at different sites. Manny explains that the nature of Boral’s work requires him to make sure his equipment is able to deliver the best possible service. He trusts the Hamelex White name because they don’t just use PBS as a simple selling point, but also educate the customer on how it impacts the business over the long haul. 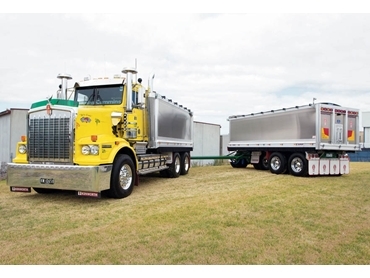 Hamelex White is a leading trailer brand from MaxiTRANS Australia Pty Ltd .